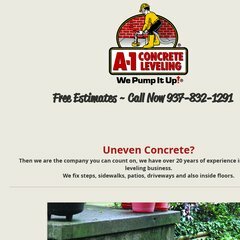 Topics: Concrete Flooring Dayton, Concrete Leveling Dayton, Patio Repair Dayton, and Sidewalk Repair Dayton. There are 2 Nameservers, ns58.1and1.com, and ns57.1and1.com. It is hosted by 1 1 Internet Inc. Pennsylvania, using Apache web server. Its IP Number is 74.208.60.192. PING www. (74.208.60.192) 56(84) bytes of data. A ping to the server is timed at 0.845 ms.